The Dragon Bash holiday event is currently in full swing in Guild Wars 2; there are holographic enemies to kill, coffers to open, pinatas to smash, effigies to burn…and as of yesterday, the story arc of the festival has started. Now, I don’t want to go into too much detail about that so far, being as we’re still only about halfway through it and it seems to be connected to the next patch that will be coming out. However, I must say that I really enjoy it so far, and there was one part in particular that stood out to me. 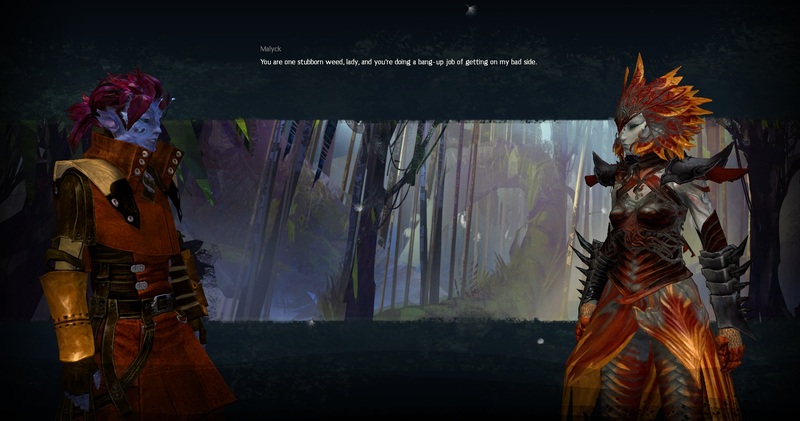 We all know how typical cutscenes are handled in Guild Wars 2. We have two character speaking to each other against a static backdrop, like so. Launch screenshots for the win. It’s not necessarily a bad way of handling cutscenes. I do have to say I prefer it over, say, the Old Republic, where it takes forever to load scenes because every single one is fully animated. However, it can be a bit flat. Marjory Delaqua, at your service. As far as the art style goes, it’s nothing out of the ordinary. A sketchy painting in typical Guild Wars 2 fashion. 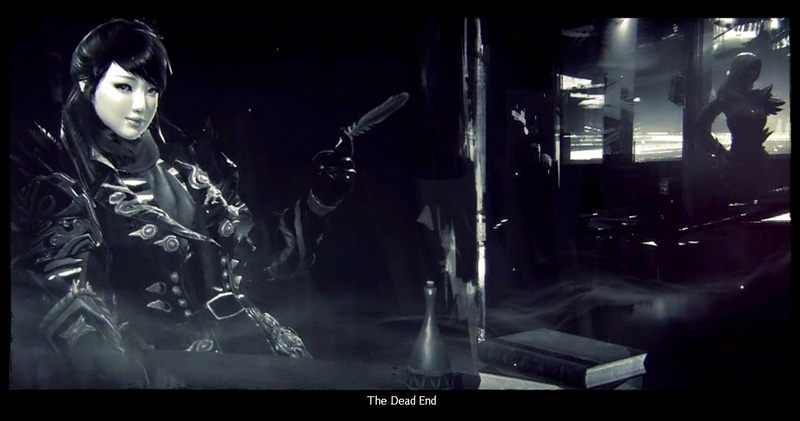 What’s so different about it, though, is the fact that the entire cutscene is presented in this fashion. It’s reminiscent of the opening cutscenes when you first create a character, but due to the story it has a…darker feel to it. Very much a 40s detective flick feel to it, here. It gives a nice twist, and is certainly preferable to sky pirates and steampunk in my opinion. We still don’t know the full story of what’s going on and what caused the tragedy that happened during the Dragon Bash festivities. And there are even more questions raised – Lady Kasmeer has reappeared, having apparently returned from her vacation on Southsun Cove; where does she fit into this? I somehow doubt she was just hanging around Marjory’s office for no reason at all. And speaking of the investigator, Marjory Delaqua…I want to know more about her. Namely, the fact that she appears very Canthan. Will Marjory solve the case? How is Kasmeer involved with this situation, if at all? I suppose we’ll find out soon! But man, I can’t get over how much I love that new cutscene style. I really hope we’ll be seeing more of that type added into the game. Meta-events are currently a very popular thing to do in Guild Wars 2. Ever since the update a few months ago that made it so you’d get a guaranteed rare-or-better from each event (formerly character-bound per event per day, now account-bound), it’s easily the most efficient way of getting rare items, and thus ecto. Where else in this game can you guarantee at least one rare item for five minutes of play? This is of course having an impact on the rest of the game. 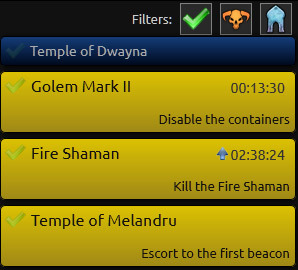 With APIs having been released, the metas can be tracked easily; no more worries about people trolling the timers. They’re always up-to-date and accurate. The price of ecto has dropped significantly – they haven’t hit their all-time low of 13s yet, but they’re currently sitting in the 18-19s range. This also means that, if you want to do other content? Good luck with that one. I find meta-events…okay. At best. They’re fun the first few times you do them, but after that, not so much. Claw of Jormag, Shatterer, Tequatl, Shadow Behemoth – all were awesome the first few times I fought them. Now, they’re just boring. There’s no challenge, nothing surprising or fun about it any longer. At this point, with the number of people who show up to them, failure isn’t even a possibility any longer; the events don’t scale even close to enough to keep up with the number of people who show up. The fact that we have the APIs to work with, and all of the timers are completely accurate, brings me to one of the biggest problems with the current popularity of simply farming metas. Since you can simply watch a timer to see what is up when, it means there’s no need to actually play the game. People can just sit around, idling, until the timer says that X event is starting. Hop to that event, complete it, wait for the next. The most efficient way of getting rares, and thus ecto and money, in this game is currently to spend 90% of your time in-game idle. I mean, I guess people enjoy it. But honestly, I think that being rewarded for not actually playing the game is kind of backwards. The other big issue is that, since the rewards for metas are better than anything else in the game, it’s hard to do anything else. Want to run a dungeon? Yeah, good luck. Who wants to do a dungeon when you don’t get nearly anything as good as you do for spending a couple of minutes mashing your auto-attack button at Jorlag? Well, some people prefer dungeons (like myself) because they find them far more fun. But even in my regular play group it’s so hard to get a dungeon group together right now…and people farming metas is definitely a part of it. As ever, what this boils down to is the fact that the rewards for most of the game simply are not very good. It’s rare to get anything worthwhile from a dungeon. Fractals seem to drop rares and exotics at a higher rate than regular dungeons, as well as account-bound items like fractal weapons and ascended rings. Being account-bound, though, if you get one you don’t like or can’t use? Oh well, too bad, so sad. Spending a few minutes doing a meta, though, guarantees you a gold – which is a good chance of turning into at least one ecto when salvaged. Since there are so many metas that have bonus chests, and most of them repeat fairly frequently, it’s easy to hit a dozen of them in a single night. That’s a dozen rares. That’s going to be on average about a dozen (or more) ecto. I’ll tag along to do metas sometimes. But the constant farming of them is something I can’t stand. I don’t use any of the overlays, or keep open any of the timers. I don’t camp out where certain ones spawn to see if it’ll pop anytime soon. I don’t hop from one to the next to the next and so on. I just don’t find that sort of thing enjoyable. And I find it frustrating, both because it keeps me from doing the things I’d rather be doing, as well as it means that I will never have anywhere the amount of money and stuff that some of my friends I play with do. There are a lot of problems with the game, and I feel like the addition of the guaranteed rare chest to meta events was an attempt to address the abysmally low drop rates, as well as to bring some more life into zones that normally would be completely ignored. But it’s just a band-aid fix; it doesn’t address the fact that the rewards for the rest of the game are terrible, and ultimately I don’t think the goal of getting people to spend more time in the mid-level zones has really worked out well; instead people will just head there, do the event, and leave, not to return until the event is back up again. There’s nothing to keep people there. I’m not sure I’d call this a game-breaking thing. But it’s clear that it’s causing havoc on the game’s economy, and it’s making it hard for people who want to actually play group content do so. And as a result, it’s come to be something that I really dislike.